Currently, owners of the older sub-megawatt class wind turbines must recondition or replace aging generators and gearboxes again and again in order to maintain production of electricity. 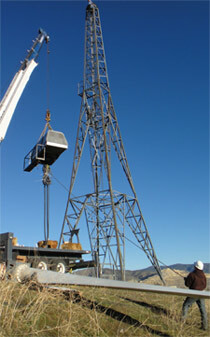 This involves shutting down the wind turbine for an extended period of time and, with crane services, removing the generator, gearbox, and other machinery to be serviced or replaced. This costly and time-consuming process extends the service life by the wind turbine by approximately four to five years, at which time the process must be repeated. 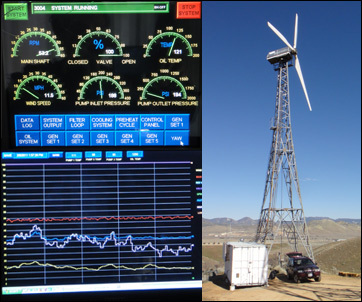 Windera offers wind farm owners a highly effective option that reduces the owners’ growing operations and maintenance costs, extends their system’s service life of 15-20 years, and increases their revenue generating potential by as much as 80%. The Windera power generation system is a direct-drive, variable-speed hydraulic drive train system that substantially changes the wind farm owner’s economics. The direct-drive solution eliminates the need for a gearbox, which is one of the most expensive components within the wind turbine to maintain and repair. The gearbox also causes energy losses as it transfers the mechanical energy from the wind turbine blades to the generator. By eliminating the gearbox, wind farm owners can produce more electricity and spend far less on maintenance and repairs. The variable-speed characteristic allows the Windera system to produce electricity across a broader range of wind speeds as compared to conventional wind turbines of the same class. More electricity equals greater profit. As a result of these capabilities, the Windera solution is far more than a simple “replacement” or “reconditioned” solution. In short, the Windera 100 solution generates more electricity and higher revenues at higher efficiencies over a longer period of time and at lower wind speeds than existing wind turbines and repair options. The number of kilowatt hours a wind turbine generates is primarily determined by the average daily wind speed of where the wind turbine is located. An interesting fact about wind energy is that for up to 1/3 of the year, today’s wind turbines produce very little usable electricity because the wind speed is near or below their start-up or “cut-in” speeds and is considerably lower than their rated wind speed where they are the most efficient. As an example, many of the older class of wind turbines do not start producing usable electricity until wind speeds reach 10-12 mph. In many wind turbine areas wind speeds remain below this level for as much as 1/3 of the year. This means that these turbines potentially only produce usable electricity for 2/3 of the year. In contrast, the Windera system will begin producing usable electricity at 8 mph! Windera’s patented low wind generator system is currently advancing revolutionary research into commercially producing a generator that can produce usable energy at extremely low positive wind speed. It is envisioned that incorporation of this technology will result in both a marked increase in power production and increase in wind farm revenues of as much as 80%.